For your convenience, you will find senior information, including graduation details, listed below. The public address system is available for daily announcements for school organizations. Organizations must obtain permission for announcements in advance from the Student Life office. Bulletin boards are also available for organizations to promote activities and events, with approval from the principal. 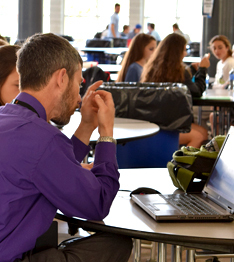 All students take part in an advisory group led by a faculty member. The groups are small and, when possible, students remain in the same group for their entire high school career. The goal of this program is to promote students’ social-emotional and academic well-being and encourage students to be responsible members of the community. Advisory groups meet about once a month to review and discuss important topics pertaining to the school or to the students themselves. Both staff members and students lead discussions and topics include information about new policies, handling stress, events in students’ lives, and grade level related topics such as the college application process. We encourage and assist students and staff members to form and participate in clubs in a wide range of interests. To begin a club, a faculty advisor must file a charter for approval with the Student Life office at the beginning of the school year. The purpose of the Ridgefield High School Chapter of the National Honor Society is to serve the school and the community with projects such as the Bloodmobile, Peer Tutoring Program, Elementary School Homework Club, and Elementary School Science Project. Students must qualify for NHS and maintain minimum grade and civic requirements. Access important information, forms, and documents here.